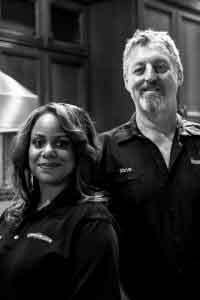 Anderson Appliance Service began with its roots in Independence, Missouri, where Steve Anderson learned the fundamentals of appliance repair through vocational training and mentoring from his father, Richard. Upon his retirement, Richard sold the company to Steve, who grew the business exponentially, and subsequently moved to Phoenix, AZ in 1996. Since then, Anderson Appliance Service has adopted a focus on luxury residential appliance repair as well as excellence in customer service. In 2011, the company expanded and Steve’s wife, Cher, joined the team part time as an administrator. Anderson Appliance’s reputation reached new heights as its commitment to service and customer satisfaction became a major component of the company’s new vision. By 2014, Viking Range, LLC had approached Steve and asked that he join their team of industry-leading service providers. Together, they have been partnering to ensure that the Viking product lines are matched with quality service to enhance the brand’s cutting edge innovation and the technological expertise of The Middleby Corporation, which have transformed the residential market in Arizona. Anderson Appliance Service is the premier residential appliance provider in Scottsdale, Arizona. For nearly three decades, we have been a leader in servicing premium refrigeration, cooking, wine preservation, and ice making products. Our factory-trained technicians work on everything from refrigerators, ovens, microwaves, and dishwashers to washers and dryers, and we strive to have everything available on site to make any repairs needed in just one service call. Anderson Appliance Service is a Viking Gold Preferred Service Company, and we provide warranty service throughout the state of Arizona. We also provide Authorized Factory Service for AGA, Marvel, Heartland, Northland, and U-Line appliances. We service most other major brands and offer certified OEM parts for repairs.